We were approached by Professor Charles McCollum, the Lawyer Monthly Vascular Expert of the Year 2016 & 2017, to help him grow his Medico-Legal practice, Cardiovascular Advisors. The practice was growing into medical specialisms beyond Cardiovascular, and needed a brand and new website that would appeal to more medical specialists, and to firms of solicitors seeking medico-legal experts and reports. We reviewed their market and competitors, interviewed some of the solicitors who are their clients, and helped them identify what exactly was appealing to their loyal clients. We ran a couple of workshops with them to get a consensus on what it was that made them distinctive - the way they are able to deliver the most authoritative reports with the most efficient and personal service. This came from the fact that they not only draw on the world-leading expertise of senior consultants such as Professor McCollum, but also have a qualified barrister running the practice, so have a deep and ready understanding of exactly what legal firms need to take to court. This enabled us to create a brand platform that would act as the basis for the naming and brand design, and for future marketing communications. McCollum Consultants brand platform – the basis for the naming, brand and communication design. The chosen design route incorporated a hexagon symbol, suggestive of molecular structure and the atomic table of elements, to convey their strongly scientific basis. The name, McCollum Consultants, builds on the strong personal reputation of Professor McCollum, gives a personal feel to the business, and fits well with professional services. The logo also incorporates a descriptor, so that people who are not yet familiar with the organisation immediately know what it offers. 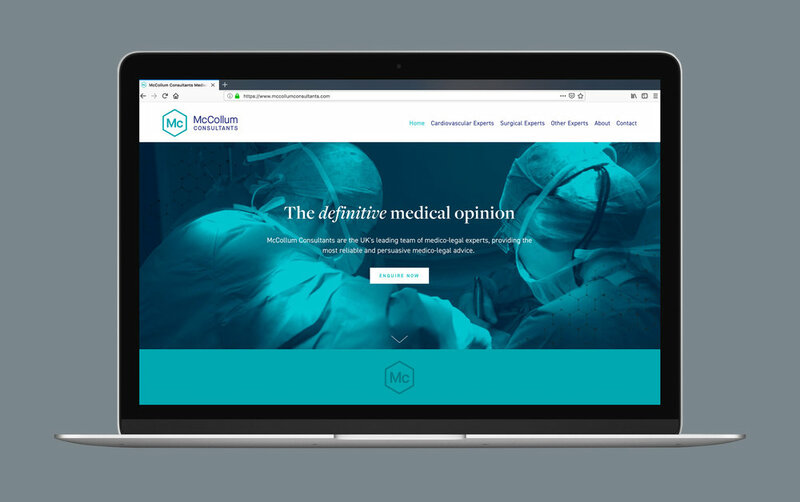 We additionally created a brand pattern, based on their hexagon – it is suggestive of McCollum Consultants being the ultimate network of medical experts – it is used as a background on parts of the website and in publications. We used some imagery of Professor McCollum in surgery to visually emphasise the medical expertise that the organisation brings, and recoloured it to fit with the brand identity system. This all comes together in their website which we designed and built to give a quality, professional look and feel, and showing the range of medical specialisms that the consultants in their network bring to legal reports and advice. Since launching the new brand we continue to update the website for them, and provide a full range of marketing support including adverts for professional journals.